The cabin was roomy. It is quaint and a bit rustic but plenty of hot water. The island was beautiful, staff were friendly and professional and there was plenty to enjoy and see whilst staying. Heron Island was an amazing experience! I was there in mid- January. Turtles: Walking the beach, you are sure to get lucky a few times and see turtle hatchlings. I woke up at 4:45 a.m. every morning to walk the beach and see the mama turtles go back into the ocean. I stayed out for 2-3 hours. I saw about 15 each morning. I even saw some finishing with their nests. (The turtles comes up at night, but it's too dark to see them. You are not supposed to use flashlights because the light could cause the turtle to go back into water. Please respect the turtles and the rules.) Guided Walks/Talks: We took the free Turtle Walk and Reef Walk led by a marine biologist. We learned a lot, and it made for a better experience on the island. Sea life: Sharks, Rays, turtles, sea stars, and more! Although, I did not see many fish when I snorkeled off the island and on the snorkel boat trip. The spa was most excellent, totally relaxing with great staff. The dive shop was just where it needed to be and did everything. The dive boat team took care to listen to our requests. The guides were wonderful and happy to help, very engaging. The educational opportunities were fantastic. While we were there they had Guided Reef walks each morning, A Marine Biologist spoke about humpback whales in the evening every other night (all free) and we also paid $10 to join a guided tour of the research facilities on the island. There were other free educational activities, but these were the ones i can remember. As for the reef walks, I was shocked when i first read this term, but you actually walk around the coral on the sandy portions at low tide and a marine biologist tells you all about the coral and other life, so it isn't as damaging as it sounds. 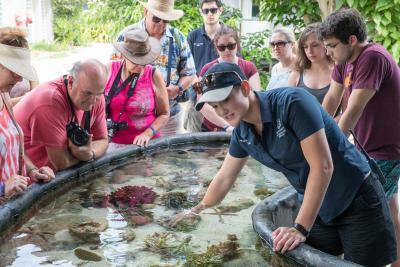 They do say that there is still impact on the reef (especially when people aren't as careful as they should be), but they continue the reef walks because of the educational opportunity and the hope that the education people will receive will encourage them to engage in conservation efforts. Phenomenal island, greet location, super welcome from the sea plane and very helpful staff, good food, comfy room, amazing snorkel spots and the tour was great AND stepping right off the beach and snorkelling with a turtle. The buffet was poor and there were not enough staff serving of replenishing the food. 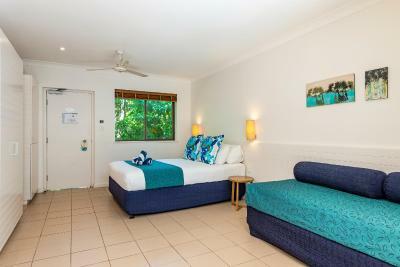 Heron Island Resort This rating is a reflection of how the property compares to the industry standard when it comes to price, facilities and services available. It's based on a self-evaluation by the property. Use this rating to help choose your stay! Located on the World-Heritage-listed Heron Island, this resort offers free snorkeling lessons in the outdoor pool and free guided reef walks. 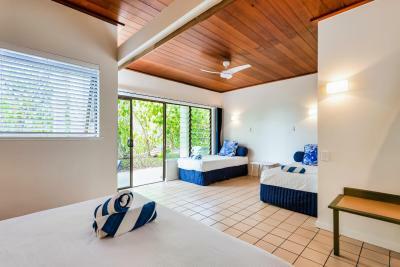 Rooms at the Heron Island Resort feature bright living areas, which open onto balconies or terraces with forest or sea views. Each has a fridge and tea/coffee making facilities. All include beach towels and sun umbrellas. 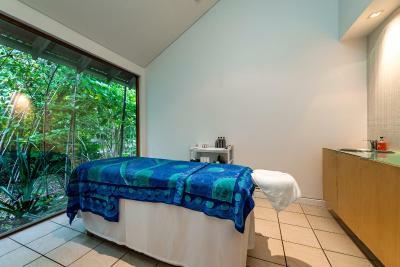 Heron Island Resort has a day spa offering massages and facials. The tour desk organizes a variety of diving and snorkeling tours around many Great Barrier Reef locations. 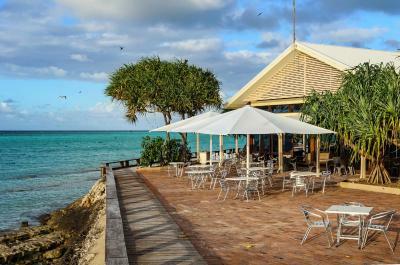 Shearwater Restaurant offers buffet and á la carte options with views over the Coral Sea. Guests can sip cocktails on the outdoor terrace or relax in the Pandanus Lounge. 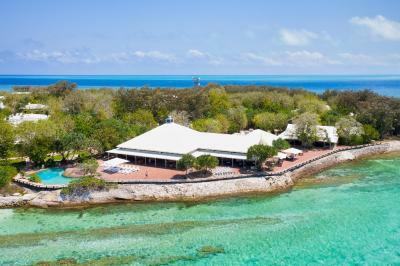 Heron Island Resort is accessible by boat, seaplane and helicopter from Gladstone. The boat departs Gladstone at 14:00 and departs the resort at 10:00 each day, except Tuesdays and Thursdays. A coach service to/from Gladstone Airport is available. 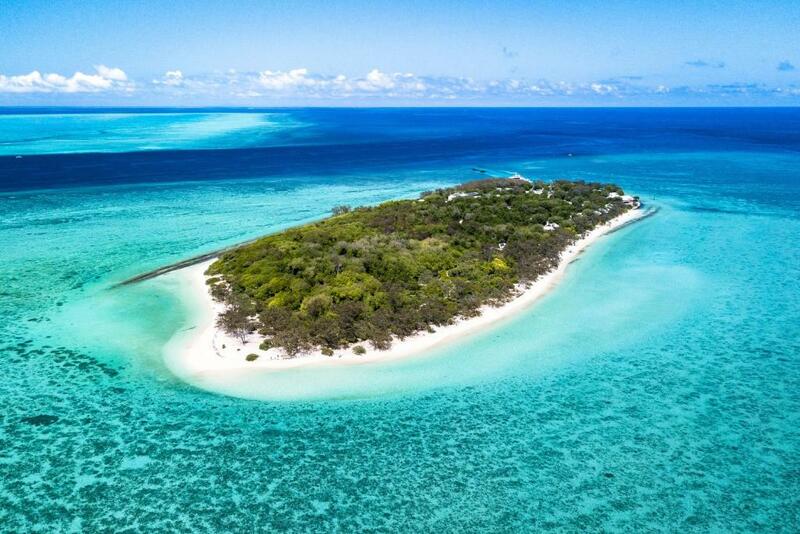 This property also has one of the top-rated locations in Heron Island! Guests are happier about it compared to other properties in the area. 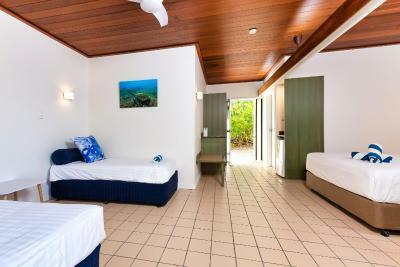 This property is also rated for the best value in Heron Island! Guests are getting more for their money when compared to other properties in this city. 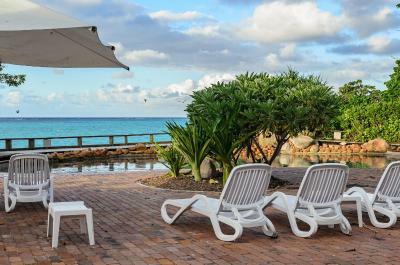 When would you like to stay at Heron Island Resort? In a garden setting, these rooms include a private bathroom with shower, plus a patio and outdoor area. 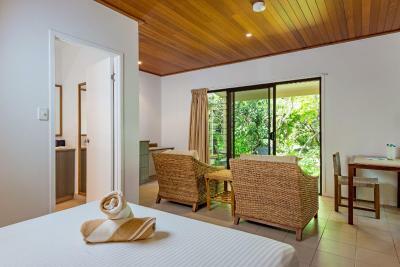 Offers filtered reef and water views through a canopy of beachside trees and shrubs. 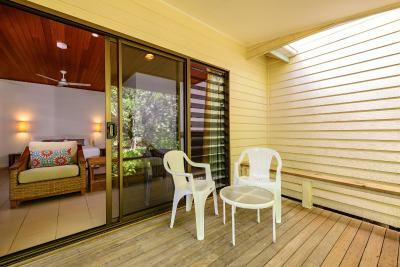 Features direct access to the beach. The living area includes a coffee table with armchairs and a large balcony. 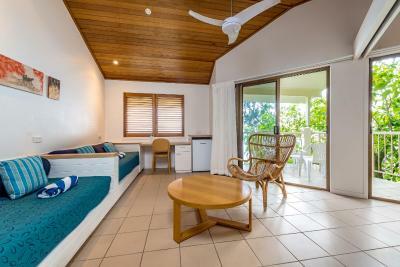 House Rules Heron Island Resort takes special requests – add in the next step! One older child or adult is charged AUD 145 per person per night in an extra bed. Heron Island Resort accepts these cards and reserves the right to temporarily hold an amount prior to arrival. Heron Island is accessible by boat, seaplane and helicopter from Gladstone. The return boat transfer will depart from Heron Island at 13:15 daily, except Tuesday’s and Thursday’s. The Heron Islander will not be operating on Christmas Day, Wednesday 26th December 2019. However will operate on Thursday 27th December 2019. The cost of the transfer on the Heron Islander is $69 per adult one way and $32 per child one way. A coach service to from the Gladstone Airport is available and included in the boat transfer cost. The shuttle coach will pick guests up from the airport at 08:30 and will arrive at the Marina approximately 10 minutes later. Guests are requested to inform the property in advance if they wish to make use of the shuttle service. Contact details can be found on your booking confirmation. Please note there is no mobile phone coverage on Heron Island. An Environmental Management Charge (EMC) of $6.50 (ex GST) per person per day (for guests 5 years and older) to a maximum of $19.50 (ex GST) per person per stay will be charged direct to guests. Price is subject to change. 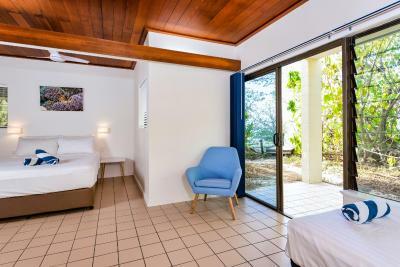 Upon arriving to Heron Island the Environmental Management Charge will be applied for the first three nights of your stay in accordance with the number of guests in the room. The restaurant was poor meal choice and not enough staff. WHEN BOOKING THERE WAS NO INDICATION THAT ON THE DAY OF YOUR CHECK OUT THERE WAS NO FERRY RUNNING THAT DAY. THIS MEANT THAT OUR ORIGINAL PERIOD SELECTED HAD TO BE CANCELLED AND ANOTHER PERIOD CHOSEN TO MATCH TRANSPORT AVAILABILITY. EVEN THOUGH WE HELD A BOOKING CONFIRMATION ON ARRIVAL AT THE GLADSTONE HARBOUR CHECK IN WE WERE NOT IN THE SYSTEM AND STAFF HAD TO CONTACT SOMEONE TO ENSURE THAT WE WERE ABLE TO BE ACCOMMODATED - THIS WAS NOT A GOOD START TO OUR HOLIDAY! The resort was filthy,the food was average and the staff were not managed. This resort is no better than a 3 star. The beauty of the reef the abundant and active marine life was the stand out. Location. This hotel is on a tiny island right in/on the Great Barrier Reef. If you enjoy being close to nature you will love this place. We saw sharks, rays and turtles from the beach. It take 2 hours by boat to reach it but its well worth it. Awesome! The resort itself is covered in bird faeces which means the smell is awful. We did not realise it had so many birds until we arrived, thankfully once on the beach you can not smell it. Pool is small and smelly too. The island itself is incredible, the snorkelling is the best, The reef and so many turtles! Staff are nice and helpful and food and wine delicious. Highly recommend the snorkel/dive trip. Location magnificent. Liked that the accommodation was basic and so limiting its negative impact on the island. Nice compromise. It was flies all over the food every day, the food was very expensive. The buffet was over priced and not even good. The beds were extremely u comfortable. Price of the hotel is fairly cheap. The location is amazing. The ocean and the reef is beautiful. Over all a very pleasant island for a short stay. Food first evening was cold heated having to complain.Second night they cooked my catch and over dry cooked too long.Thankfully next two nights good. The island is home to 200,000+ bird (which is fine), but this leaves a horrible ammonia smell across the whole island - something I wasn't informed or prepared for (you will get pooped on). The boat ride over is also very rough (I was sick even with travel sickness tablets). The food is mediocre but over priced for what you get (either bigger portions or cheaper prices needed). There is also nothing to do at night and your rooms lack basic amenities (no lock or key entry, no telephone, no television). The buffet dinners, the ferry schedule to and from the island, the lack of extra amenities for this level of resort. The nature, the snorkelling, the fact that it was a nature reserve.